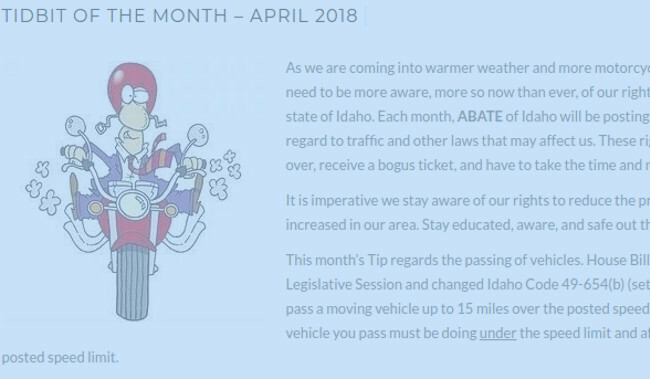 This month’s tidbit deals with changes in Idaho’s law when passing vehicles. House Bill 132 was passed in the 2017 Legislative Session and changed Idaho Code 49-654(b) (set out below) by stating we can now pass a moving vehicle up to 15 miles over the posted speed limit on two-lane highways. The vehicle you pass must be doing under the speed limit and after passing, you must return to the posted speed limit. Note that the old rule was you could only pass a vehicle at the speed limit and could receive a citation if over the speed limit. Not the case anymore. Idaho Code § 49-654(b) – Subject to all other applicable motor vehicles laws, a driver of a passenger car, motorcycle or pickup truck, not towing any other vehicle, may exceed the posted speed limit by up to fifteen (15) miles per hour while passing another vehicle traveling at less than the posted speed limit, in order to safely pass the vehicle. The overtaking vehicle shall return to the right-hand lane and reduce speed to the posted speed limit as soon as practicable. This paragraph shall be applicable only to passing on the left upon roadways divided into two (2) lanes providing only one (1) lane of traffic in each direction and where the posted speed limit is fifty-five (55) miles per hour or greater. This paragraph shall not be applicable in construction zones. For purposes of basic rule violations and penalties imposed pursuant to this section and Idaho infraction rule 9, the fifteen (15) mile per hour allowance in passing situations provided in this paragraph shall be deemed to be the maximum speed limit from which fines are determined. If anyone has questions regarding this article, a law that has or might affect themplease email Lori B! at iamqueenbsings1@gmail.com. If you would like to offer new ideas for Tidbits of the Month, please submit via our contact form.